The familiar blue and white flag of the United Nations is now flying over the Casa de la Cultura Ecuatoriana in Quito, Ecuador, home of Habitat III, the United Nations Conference on Housing and Sustainable Development. The raising of the United Nations flag signifies the transformation of the conference venue into a global arena for the 193 countries that comprise the United Nations. The Habitat III Conference will take place from Monday, 17 October, until 20 October 2016. Quito, the capital of Ecuador, is home to 1.7 million people. 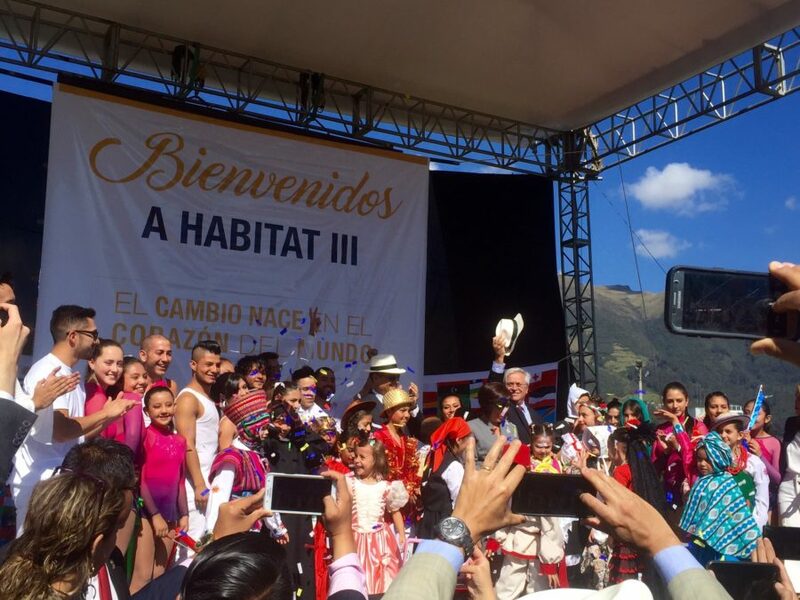 “The city of Quito will be remembered as the city in which a new paradigm of urbanization was adopted as an important instrument for millions of world citizens,” said Dr. Joan Clos, Habitat III Secretary General and co-host of the ceremony along with Ecuadorian president Rafael Correa and minister of housing and development Maria Duarte. A pure blue sky was the perfect backdrop to the ceremony, which was followed by a song and dance performance. Quito has undergone a remarkable urban transformation process over the past decades. It is also an indicator city in Latin America, currently the one of the fastest urbanizing regions in the world. This century will see a substantial majority of the world’s population living in urbanized areas. Today, roughly 55% of the world population is urbanized, some 3.7 billion people. This is forecast to double to 7 billion by 2050. There has never been a more urgent time to harness the potential of sustainable urban development – and to address the challenges it presents now and into the future. In response, the mission of the Habitat III Conference is the adoption of the New Urban Agenda, an action-oriented document, which will set global standards of achievement in sustainable urban development. “The New Urban Agenda stands in recognition of urbanization as an opportunity for the development and wealth of all nations,” said Dr. Clos. Together with committed partners, relevant stakeholders, and urban actors at all levels of government as well as the private sector, the United Nations will use Habitat III to adopt the New Urban Agenda, an action-oriented document which is the first step in this global response to the challenges and opportunities of urbanization in the 21st century. The raising of the flag is both a symbolic gesture and profound statement of commitment to this goal.